Although she’s a rookie in the NWHL, Mallory Souliotis has a slight edge over some of the league’s other first-year players. 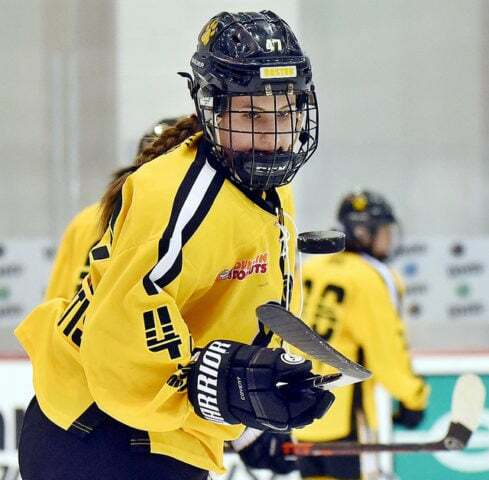 She signed with the Boston Pride following the conclusion of her collegiate career last spring and joined the team for their final two regular season games. Now in her first full season as a pro, the Yale University graduate has been a valuable asset on the reconstructed Pride blueline. 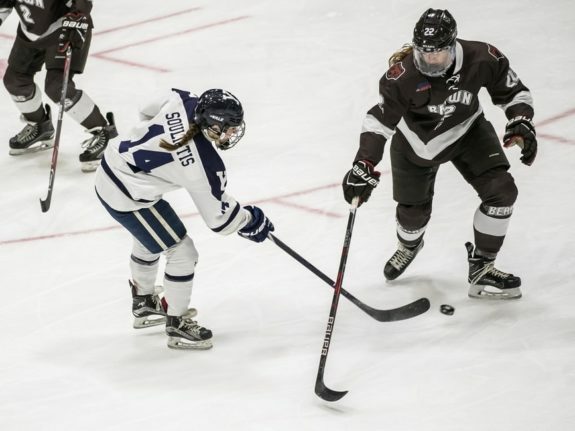 Souliotis is one of Boston’s three rookie defenders (Toni Ann Miano, Lauren Kelly) and the trio has combined for 11 points (6g-5a) while complimenting the three veteran defenders (Alyssa Gagliardi, Lexi Bender, Kaleigh Fratkin) as well. Last season the Pride finished under .500 for the first time in franchise history (4-8-4, 12 points) – but this season with a retooled roster, some returning Olympians, and a new coach, Boston has already surpassed last season’s point total (7-3-0, 14 points) in only ten games. I feel pretty confident in saying that the Pride should be one of the favorites once the playoffs and the chase for the Isobel Cup begin. Following Boston’s overtime win in Connecticut on December 30 we spoke with the 22-year-old Souliotis about making the jump from college to pro hockey, why she wears no. 47, and other topics. The Hockey Writers: Was getting drafted by an NWHL team a big deal to you? THW: As a girl from Massachusetts why did you choose to go to Yale instead of one of the plethora of universities in your home state? MS: The education I was able to get is unparalleled. The hockey team there was really warm and welcoming, the coaches were really excited to have me and I thought I could make a really big impact going there. Getting a little distance from my family allowed me to mature a lot as a person, but also for hockey and getting an unbelievable education. THW: What was your major? MS: I majored in biomedical engineering. I really like math and science. It’s kind of nerdy but I really like math, (smiles) that’s me. THW: You signed with the Pride for the final few games last season, was there any hesitation? Did they reach out to you in-season? MS: I did not talk to anyone until after the (Yale) season was over. Our season ended on Saturday I believe and coach (Thomas) Poeck called me on Monday afternoon. I had just finished class and was about to head to the gym and workout. I honestly knew it was a possibility, and I always hoped, but I never really knew what was going to happen. I was really surprised and excited. It kind of worked out with my class schedule – being able to come back to Boston and get a couple of practices in before games, and meet everyone. THW: Did getting that experience help you heading into this season? Getting a firsthand idea of what the speed and tempo of this league are all about? MS: Absolutely, I think it made me realize that I should play confidently because I can play at this speed, and at this level; that really helped me coming into this season. THW: Boston has been successful this season and the roster almost seems like it’s structured like a college team. Is that a fair assessment? MS: It’s great to have people to look up to, ask questions, and just watch them; use them as good role models. Obviously, they’ve been very successful here in the first couple of years, so it was great coming in at the end of last season – they were all very welcoming. They helped me out, answered all of my questions and stuff like that. THW: Why did you choose to wear no. 47? MS: (grins) I’ll take a little jab at Demps (Jillian Dempsey), I was no. 14 in college and in high school so I had to pick something else. I always kind of liked the higher numbers and wanted something new. I like to model my game after Torey Krug on the Boston Bruins, he’s one of my favorite players who also wears no. 47. But I also like the Bruins forward Jake DeBrusk who wears no. 74 so it all worked out. I really like how feisty they are even though they aren’t the biggest guys on the ice; they play smart, they play fast. THW: Would you rather score a goal or block a shot to save the game? MS: Oh, I would love to block the shot! Way more than anything else, I’m not really a big goal scorer. THW: You have one of the most unique Twitter handles in the league (@yourpalMAL9), whereas most of the players in the league just have some combination of their name and number; how’d yours come about? MS: It started I think in high school, and everyone started calling me ‘Mal Pal’, or ‘Pal Mal’ and I just rolled with it. In college it stuck as ‘Mal Pal’ and I think I even had it on my stick one year. I like it, I know Mallory is a mouthful on the ice so Mal is usually the best.